Supercell releases Brawl Stars emojis as well as stickers which are now available in iTunes and iOS for the iPhone! 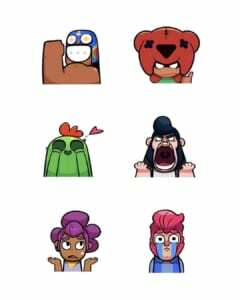 Supercell has recently released Brawl Stars emojis and stickers for iOS. The Brawl Star emojis have static and animated variants and are free to download on the App Store. Some available brawlers so far are Colt, Shelly, Crow, Spike, Mortis, and Poco. The brawlers can mimic your facial reactions and voice to a certain extent. Meanwhile, the stickers have brawlers like Nita, Bull, and El Primo. These stickers can be used in certain messenger apps like Whatsapp. Brawl Stars’ animated emojis can be used by iPhone users, but there is no word yet as to when they will be available for Android.